Game 2: Spurs at Nuggets, Tuesday, 8 p.m. Contrary to reports, the Spurs didn’t “steal” Game 1 of their Western Conference first-round playoff series Saturday night in Denver. Exuding a quiet confidence, the Silver and Black walked on the court at the Pepsi Center and played like they owned the place in a 101-96 victory over the Nuggets, who finished the regular season a league-best 34-7 at home. The Spurs had the worst road record (16-25) among the West’s eight playoff teams, and were blown out by 28 points in their previous game at Denver on April 3. But San Antonio hit big shots Saturday night, played solid defense and got key contributions from two players making their first playoff starts, point guard Derrick White and guard Bryn Forbes, to win a postseason game on the road. As they prepare for Game 2 on Tuesday in Denver, the Silver and Black aren’t kidding themselves about the challenge they’ll face against a Nuggets team determined to even the series before it heads to San Antonio. 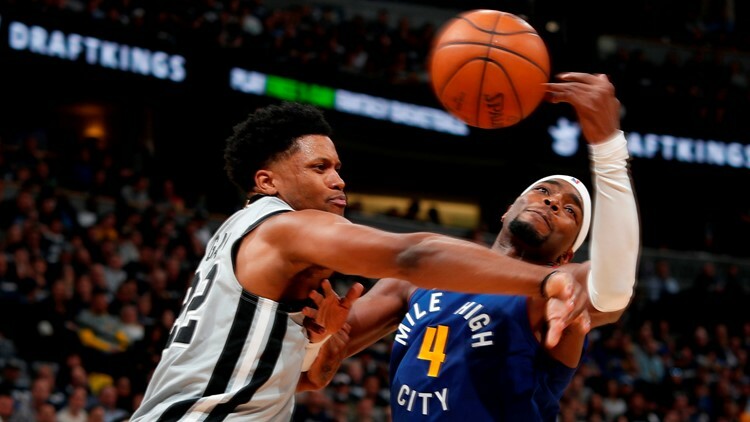 Forward Rudy Gay, battling Denver forward Paul Millsap for a loose ball, came off the bench to score 14 points and grab six rebounds in the Spurs' 101-96 win in Game 1 of their first-round playoff series in Denver. Forbes expressed the same sentiments after Game 1. “It’s a big game, a big win that we needed,” he said. “The job isn’t even close to done, so we’re not too proud of ourselves or anything like that. It’s a step forward in the right direction and we’re ready to get going for Game 2. Still, for one night at least, the Spurs showed they can win a playoff game on the road. And that’s got to be a confidence booster for a team that struggled to win consistently in opponents’ arenas this season. DeMar DeRozan scored 18 points to lead five San Antonio players in double figures, White (16), Forbes (15), LaMarcus Aldridge (15) and Rudy Gay (14) pitched in to give the Spurs’ offense balanced scoring. Gay, who scored 10 of his 14 points in the second quarter when San Antonio went up by 12, made 6 of 9 shots, including 2 of 3 from the three-point line. He also had six rebounds. A third-year pro, Forbes was a model of efficiency, scoring his 15 points on 6-of-9 shooting and making 3 of 4 three-pointers. He also finished with five rebounds. But the biggest star for the Spurs was White, whose performance was described as “spectacular” by coach Gregg Popovich. White had two of the game’s highlights, scoring on a monster dunk over Denver forward Paul Millsap and coming up with a steal that sealed the victory for San Antonio. 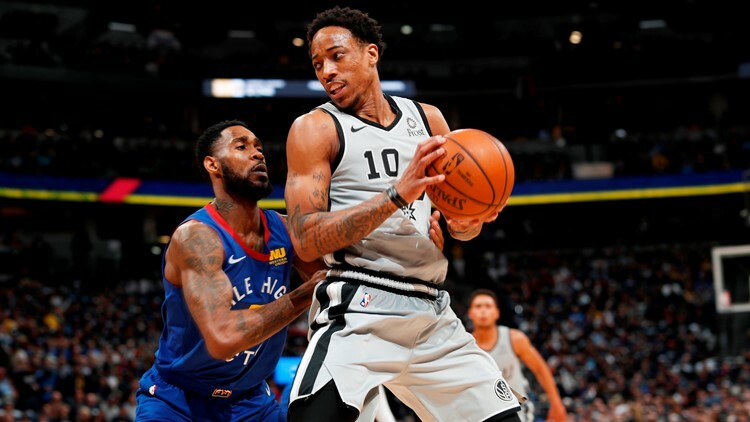 DeMar DeRozan led the Spurs with 18 points, 12 rebounds and six assists in Saturday night's 101-96 road win over the Nuggets in Game 1. White stole the ball from Denver guard Jamal Murray with 1.3 seconds left, and hit both free throws to end the scoring after getting fouled immediately by Murray. It was redemption for White who lost the ball to Murray with 1:09 left and the Spurs clinging to a 97-96 lead. Murray missed a three-pointer with 57.7 left and a shot inside the free-throw line went off the rim with 9.4 seconds remaining. White scored 16 points on 7-of-10 shooting and added five assists and the critical steal. He also played a key role on the defensive end of the court, helping hold Murray, Denver’s second-leading scorer, to 17 points on 8-of-24 shooting. Murray finished 0 of 6 from the three-point line. Jokic, the Nuggets’ leading scorer during the regular season with a 20.1 average, had only 10 points in Game 1, but he finished with 14 rebounds and 14 assists to record a triple-double. Denver was 16-0 when Jokic gets a triple-double at home. White, who is in his second NBA season, was asked about the poise he and Forbes demonstrated in their first playoff starts. The game was a homecoming for White, who grew up in Parker, Colo., about 35 miles south of Denver. He also played at the University of Colorado for one season before getting drafted by the Spurs in 2017. DeRozan, who also led the Spurs with 12 rebounds and six assists, lauded White. Led by Gay, the Spurs’ bench outscored the Nuggets’ reserves 31-22.